Oil Starts 2018 with a BANG! BANG! That Futility piece wasn’t read very much, but it’s an important piece. Very important. The world is coming out of a low volatility period and using the Macro aspect of our Core 4 Investing Process is going to be very important in coming years. Let me quick about this, you need to have an overweight to energy stocks, in particular oil. I am a buyer of Encana (ECA) at these prices. Selling cash-secured puts roughly at the money a couple months out and using the premium to buy LEAPs for January 2019 roughly at the money is a great idea in my opinion. I like selling the Encana $14 February puts for about 80¢ and buying the $15 January 2019 LEAPs for about $1.60. So, you’ll have to sell twice as many puts as you buy LEAPs to have no out of pocket cost. Remember, you might end up owning ECA at $14 per share. We’re okay with that. I think Enanca goes to $20-30 in the next couple years as oil runs to $80. Why? Because as they discussed in November, the company is cash flow positive in 2019 at $50 oil. They are cash flow positive at $53 oil in 2018. Oil is currently above $53 and I think heading to $80 soon. I also like buying the SPDR S&P Oil & Gas Exploration & Production ETF (XOP) as a base holding and also buying LEAPs on it to 2020. The LEAP I’d buy NOW is the $37 January contract for about $6.00 to $6.50. 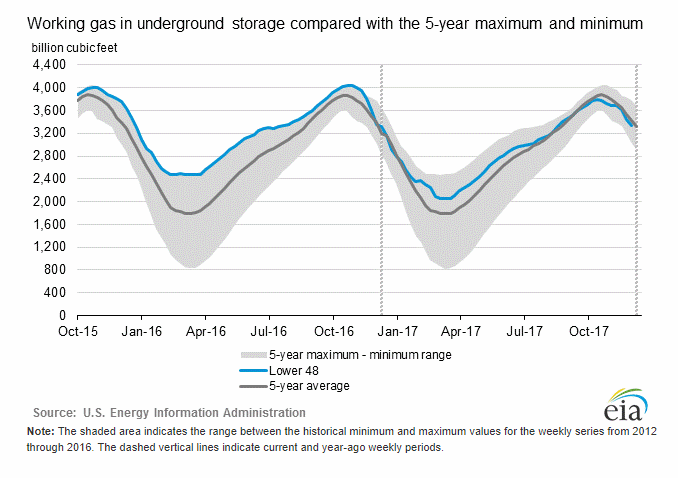 My favorite natural gas play is Antero (AR). Love it, own it, cuddle with it. They are cash flow positive and as the eastern part of the country gets colder their share price will get warmer. You can buy the shares, sell at the money puts and buy calls. I like the May 2018 and January 2019 $20 calls on Antero. Buying ECA, AR and XOP gives you a very good spread on oil and gas stocks. I like that grouping a lot, it’s what I have along with XES, OXY, KMI and AMLP in my portfolios. I am a bit over 25% to this group of holdings right now. That’s 4x the S&P 500 weighting to energy. If I weren’t a registered person subject to regulatory oversight AND I was an aggressive investor, I’d be up between 35-50% in energy right now. That’s a risky proposition, but could be a big winner in 2018. A quarter to energy is fine for most folks though because getting greedy usually ends badly. For those of you new to MOSI, you might not know that Exact Sciences (EXAS) has twice been a home run for me. I originally invested in the $3 range about a decade ago and then loaded up at $1.65. I eventually added a couple tranches of LEAPs before the FDA and CMS approvals years later. The result for early investors and those using options was more than a ten-bagger. After taking profits when the stock first hit about $30, I started buying back in around $20. The stock plunged though on an ambiguous USPSTF statement that was put out by a political opponent of the Affordable Care Act. With the stock in single digits I backed up the truck on shares and LEAPs. 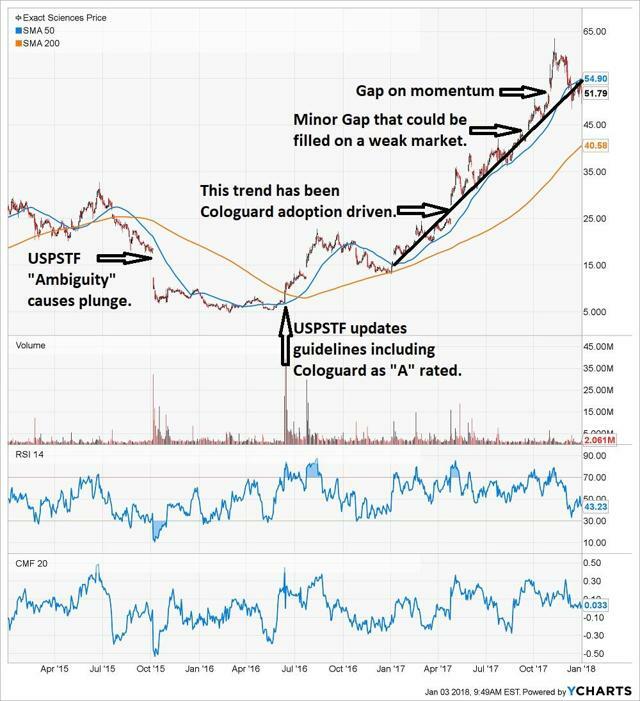 After the chair of USPSTF was replaced in unusual fashion and the USPSTF clarified their language to make it clear, the stock began it’s ascent that recently stalled, reaching a high of $63.60. Almost right at the top, I advised people to take profits and pair back their Exact position to a normal sized position of 2% to 4% of their portfolio. There are two gaps that Exact might fill in the short-term. The first, around $51, has already filled and been bounced off of twice. That is a good sign. That second minor gap could get filled. It would require a weak market or some sort of minor disappointment from Exact in my opinion. The trend up for this stock is very, very strong. It is supported by Cologuard adoption for now, but soon will have other catalysts. Cologuard adoption by the way is still way underestimated by analysts, so, there will be beats for quite a while yet. As I’ve mentioned a few times now, not only will Exact start to develop a few new products for several years down the road, but they will in all likelihood sell some of their pipeline for the cash needed to develop what they keep for themselves. We already know they are great at partnerships, so there’s more of that developing I’m sure as well. There is the J.P. Morgan Healthcare Conference next week, so I’m sure the company will put out some more details about Cologuard adoption and the pipeline. If you do not own Exact, I suggest either buying shares in the lower $50s or selling cash-secured puts. If the stock does fall to lower $40s, be ready to add more. I think the high side of my 2-4 year price target of $100-200 is most likely for EXAS shares. Technology advances are what changes the world. The steam engine, the light bulb, cars, computers, the internet, cell phones… the list is massive. As we become smarter or at least more ambitious, we find ways to have more and more done with technology. The biggest opportunities coming are in smart everything. IoT, AI, AR, VR and alternative energy with a smart grid that powers smart electric vehicles. We’re even going to see a tech based solution to methane and CO2 that churns out plastics without using petroleum. What’s coming is amazing and it’s only a few years away. We need to be invested in technology. If we are not, then our portfolios will languish. Not only do we want to find some cutting edge young companies, but we want to own the “pick and shovel” companies as well. Supporting the “smart everything” economy will require a lot of DRAM! So, that’s a shout out to Eric S who I had a long conversation with yesterday. He’s a subscriber and engineer who used to work at Intel and is still in tech. His experience and expertise is extremely valuable to us. We talked about Micron (MU) and the entire memory/storage complex for computing. I have been touting Intel (INTC) as a growth and income pick on dips, but Micron is probably better for overall returns, at least for the near term as DRAM pricing, which is run by the oligopoly of Micron, Samsung and SK Hynix is very firm and shows few signs of falling off. The global DRAM market has been quiet this December due to the holiday season in the US and Europe, according to the latest survey by DRAMeXchange, a research division of Trendforce. While there is some upside demand from customers in China and Taiwan, trading volumes have been relatively low. In general, contract prices of DRAM products in December have been on the same level as they were in November. The average contract price of mainstream 4GB DDR4 PC DRAM modules is maintained around US$31.25. Going forward, the supply of PC DRAM is expected to remain tight in 1Q18 as DRAM suppliers allocate more of their production capacity to mobile DRAM and server DRAM. As a result, the average contract price 4GB DDR4 modules is forecast to inch up further to nearly US$33 in 1Q18. Contract prices of PC DRAM have risen for six consecutive quarters since the middle of 2016, from around US$12.5 to the recent average of US$31.25. This represents an increase of more than 150%. DRAM prices are expected to keep climbing as supply growth remains limited and technological migrations become more challenging. Major DRAM suppliers have seen huge profits because of the price uptrend, and the operating margins of the top three suppliers – Samsung, SK Hynix, and Micron – all surpassed 50% in 3Q17. Conversely, this has been a tough period for companies working in the downstream of the DRAM supply chain. Memory module makers (e.g. Kingston, ADATA, and Transcend) and end product brands (e.g. Dell, Lenovo, OPPO, and Vivo) are seeing their already tight profit margins significantly eroded by the growing bill of material [BOM] costs. The situation is even more serious for some module makers and brands belonging to the second- and third-tier groups because they lack bargaining power. For them, there is practically no limit to the rising prices. Even if they are willing to accept the price hikes, the DRAM suppliers may not have products ready for shipments. In terms of outlook of the industry for 1Q18, the smartphone market will be impacted by the retreat of iPhone shipments and the weakening demand for handsets from Chinese brands. However, demand for servers will still be very strong and will help keep pushing up prices of DRAM in general. With the suppliers controlling the market, DRAM customers will need to quickly build up their inventory and arrange long-term contracts with suppliers. Long-term contracts ensure regular supply for customers, but the amounts of products that suppliers are willing to offer might be less than what customers demanded. With quotes already high and rising, customers are compelled to accept the terms of the suppliers. Thus, profits of suppliers in the upstream have swelled, whereas profits of companies in the downstream have contracted. This imbalance has now become the new normal in the DRAM supply chain. There are news reports that China’s National Development and Reform Commission (NDRC) has met with Samsung representatives to express concerns about the recent surge of DRAM prices. Whether the reports are true or not, NDRC is probably making a political statement rather than doing something substantial about the price hike. NDRC’s involvement in the DRAM market would also be limited to developing strategies for China’s semiconductor sector. DRAMeXchange does not expect significant changes to the current market situation in the short term. The DRAM price upswing is projected to continue through at least 1H18, and tight supply will likely persist before major capacity expansions from the top three suppliers and the rise of China’s memory industry. Nevertheless, DRAMeXchange will be closely following the developments between the Chinese government and the South Korean memory makers. Micron and Intel are “pick and shovel” companies for tech. Micron probably has another good run in it coming as it pays down debt and business remains firm. For the aggressive investor, Micron looks like a buy in the lower $40s. This looks like consolidation with a double bottom and the next earnings could be very good – setting up the next rally. Be careful in sizing as the stock could head down to the 200-day moving average on breaking market price trends. If it went below the 200-day I’d be surprised, but if it it does, that means there was bad news about the company. Intel doesn’t seem to want to drop below its 50-day moving average and really does appear to be breaking out. However, as Eric pointed out and I agree, the company has a hard time moving the needle because it is so big. It’s a stock for folks not looking for a homerun, but rather a big company with a good dividend that will grow with the tech space. That’s not a bad thing to have because tech is a growth leader. Disclosure: I am/we are long AR,ECA,XOP,XES,OXY,KMI,AMLP. Additional disclosure: I own a Registered Investment Advisor – https://BluemoundAssetManagement.com – however, publish separately from that entity for self-directed investors. Any information, opinions, research or thoughts presented are not specific advice as I do not have full knowledge of your circumstances. All investors ought to take special care to consider risk, as all investments carry the potential for loss. Consulting an investment advisor might be in your best interest before proceeding on any trade or investment.